At DutchCrafters we offer a wide variety Amish made sofas in a variety of styles and sizes to suit your living room and family room needs. 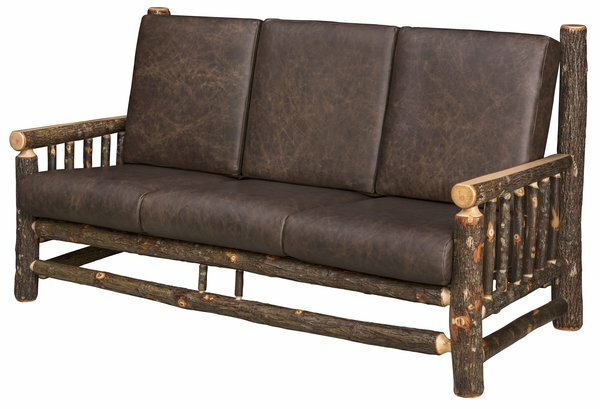 This Rustic Hickory Lodge Sofa is Amish handcrafted from Hickory Twigs and Logs. It is as comfortable as it is beautiful. Choose from fabric or leather cushions to complete your rustic sofa look. Contact our talented team of Amish furniture specialists today for additional information or to receive finish or fabric samples to help make the decision process a bit easier. Complete the look with our Amish Rustic Hickory Lodge Loveseat, Lodge Chair and Ottoman.